As if Lyme disease isn't troubling enough, a more serious tick-borne disease may be emerging, experts warn. Powassan virus, which is a far rarer and more deadly pathogen than the bacterium that produces Lyme, is also transmitted by the deer tick. The virus can cause inflammation in the brain, which leads to death or permanent disability in 60 percent of cases. So far, 75 instances of severe disease have been reported to the Centers for Disease Control and Prevention. Just last week a 5-month-old baby from Connecticut was diagnosed after developing neurological symptoms. 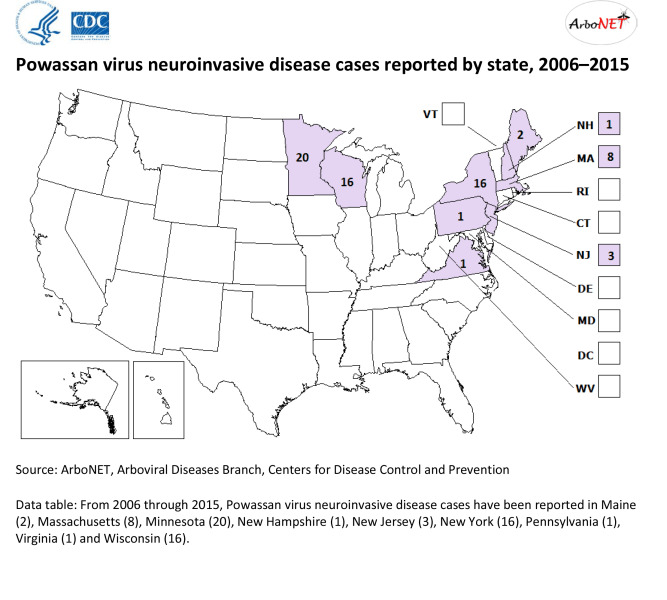 Lindsey, Nicole (CDC/OID/NCEZID) / CDC Where the Powassan virus is found in the U.S. Especially worrying, the virus can be transmitted from the tick in as little as 15 minutes, Lyons said. In comparison, the Lyme bacterium needs 24 hours to pass from a tick to a human. Few have heard of Powassan virus, but it’s been around for a long time. The first reported case was in the 1950s in Ontario, said Durland Fish, a professor emeritus of epidemiology and microbiology at the Yale School of Public Health. It wasn't considered a big problem then because the virus had been transmitted by a tick that rarely bit human beings, Fish said. But that changed when it appeared in deer ticks. Experts don’t yet have a handle on how many people have actually become infected with the virus, since the current stats are based on people who developed severe disease. “It’s quite possible that many, many more are infected and not identified because their symptoms are mild,” said Ann Powers, chief of virology activity in the arboviral diseases branch at the CDC. Right now, nobody knows how fast or far the virus will spread. VICTORIA AROCHO / ASSOCIATED PRESS The Powassan virus can be transmitted from a deer tick in as little as 15 minutes. In comparison, the Lyme bacterium needs 24 hours to pass from a tick to a human. There is some evidence that the virus’s range may be on the rise in the Northeast. A 2013 study that looked at New England deer found that the percent showing signs of infection had been steadily increasing between 1979 and 2010. 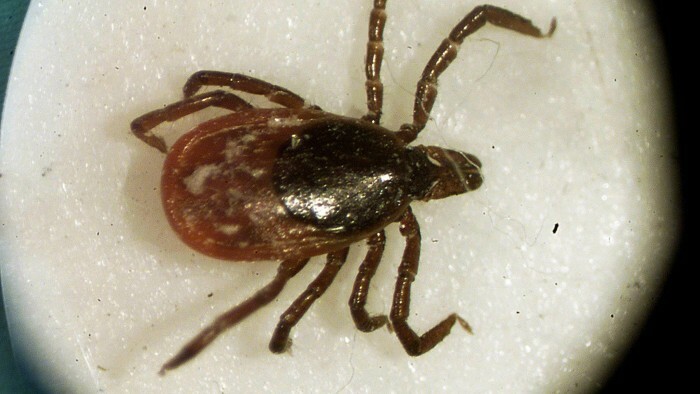 Since the deer tick picks up pathogens from the deer it bites, this suggests that the number of ticks carrying the disease is also on the rise. A recent report from the Maine Medical Center Research Institute backs that up. Researchers found that 7 percent of adult ticks and about 10 percent of ticks in the nymph stage carried the Powassan virus. Not everyone is convinced that the virus is spreading fast. Rafal Tokarz and his colleagues studied ticks in New York state and found only 1 to 2 percent carried the virus. That’s compared to 20 percent carrying the Lyme bacterium, said Tokarz, an associate research scientist at the Center for Infection and Immunity at the Mailman School of Public Health at Columbia University. “If it’s 20 percent then your chances are one in five that the tick on you will give you Lyme,” he added. One thing experts do know is how the virus becomes deadly. “The virus goes up to the brain and attacks the parts that keep you awake, keep your heart rate steady and your breathing drive going,” Lyons explained. For those who develop this severe form of the disease, the statistics are somber: 10 percent die and 50 percent end up with some form of neurological disability. There is no real treatment for the virus, just supportive care until the body vanquishes it. Original story posted by the Linda Caroll, Today.